In the early twentieth century the rise of astrophotography gave us the ability to determine the brightness and spectra of stars with reasonable accuracy. Astronomers such as Annie Jump Cannon were able to use these measurements to classify stars into types. Combined with the ability to determine stellar distances using parallax, Ejnar Hertzsprung and Henry Norris Russell plotted stars by absolute magnitude (brightness) and color. 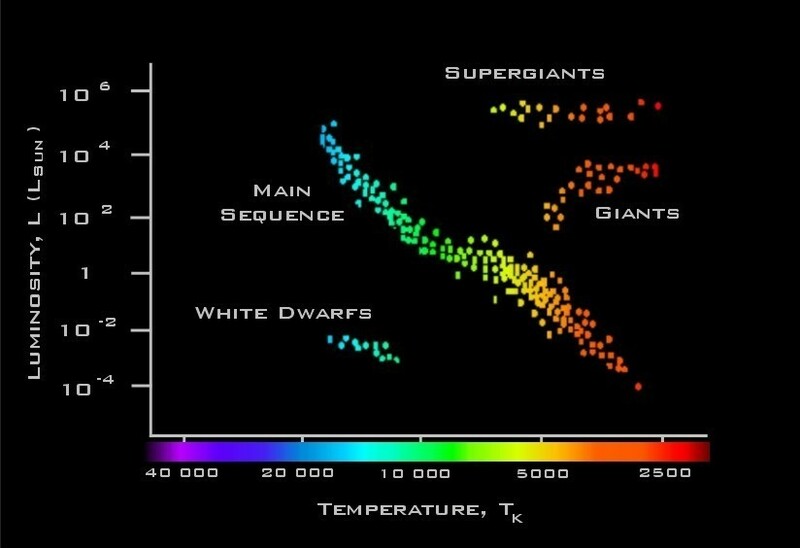 This Hertzsprung-Russell diagram, as it came to be known, found that most stars lay along a roughly linear region known as the main sequence. Stars along the main sequence follow a particular trend, where hotter stars tend to be brighter. That might seem like an obvious thing, but the diagram also showed hot but dim stars (white dwarfs) and cool but bright stars (red giants). What the main sequence really showed is that for most stars the more massive a star the brighter and hotter it tends to be. It was an indication that mass was an important factor in a star’s energy production. It was a bit of a surprise, since if stars shined simply due to gravitational collapse, one would expect age to be the main factor of brightness, not mass. The HR diagram led us to the understanding that nuclear fusion powered stars, aided by the extreme heat and pressure created by a star’s weight. A similar relation can be found for galaxies. 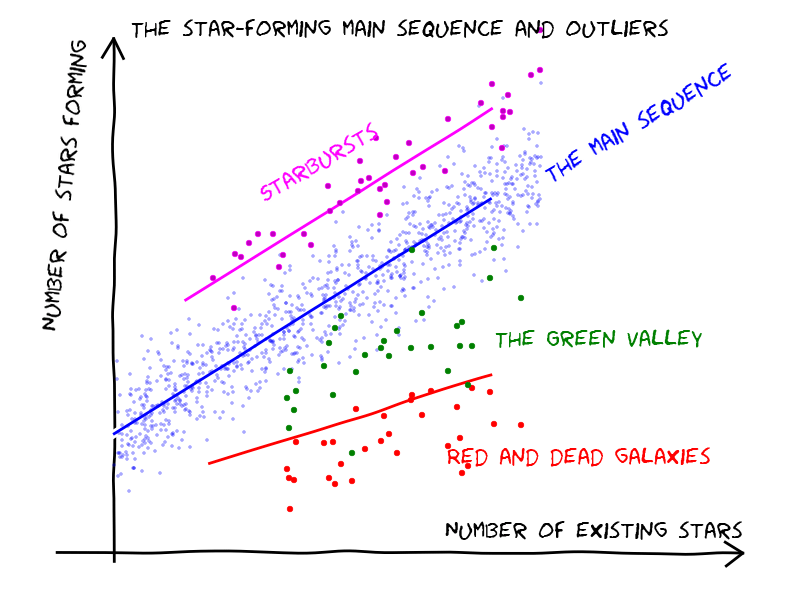 If you plot galaxies by the estimated number of stars they have and the calculated rate at which stars are forming, then you find that most galaxies lie along a line. It turns out that the more stars a galaxy has, the more stars it tends to create. This makes sense because as large stars die they tend to explode to create the gas and dust necessary for more stars. But we also see other groups. Galaxies with lots of red dwarf stars tend to have little star production, since red dwarf stars don’t explode to make gas and dust available. Starburst galaxies are producing stars at a much higher rate than expected, probably due to a collision with another galaxy. Just as the stellar main sequence can help us understand how stars evolve over time, the galactic main sequence helps us understand how galaxies form and evolve.